The only veggie I can get my son to eat is spinach! How weird is that?! 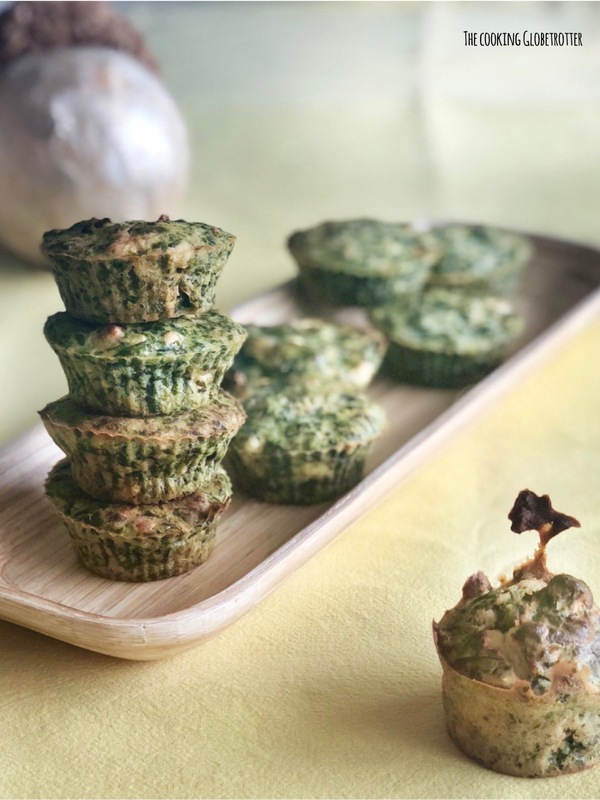 So, no need to say, that we are always on the look for healthy but tasty recipes with spinach. Bjorn and Lena have a lovely Instagram account and blog called cocinasera. They posted a recipe for quick and yummy savoury muffins. I have adapted it a little, bringing in my italian touch and am sharing it here with you. 1. Preheat the oven at 200 degrees. 2. Cook the spinach (450g – a bag) in a pan, until most of the water, is evaporated. Let it cool down. 3. Mix 2 eggs with the oil (50ml) and milk (240g). Add salt (about 4g). 4. Add the cooled-down spinach. 5. Time to pour the dry ingredients in the mixture: flour (240g), baking powder (2tsp), a pinch of nutmeg powder (if you don’t like it, add pepper instead) and 30g of good quality grated parmesan. 6. Finally, crumb the feta and add it to the mixture. Don’t mix too much now. 7. Pour it in 12 to 15 muffin tins, depending on how big yours are. I do not use paper, because mine does not need it (silicon), but you can if you like. 8. Bake in the hot oven for 15 to 20 minutes. Cook the spinach (450g - a bag) in a pan, until most of the water, is evaporated. Let it cool down. Mix 2 eggs with the oil (50ml) and milk (240g). Add salt (about 4g). Time to pour the dry ingredients in the mixture: flour (240g), baking powder (2tsp), a pinch of nutmeg powder (if you don't like it, add pepper instead) and 30g of good quality grated parmesan. Finally, crumb the feta and add it to the mixture. Don't mix too much now. Pour it in 12 to 15 muffin tins, depending on how big yours are. I do not use paper, because mine does not need it (silicon), but you can if you like. Bake in the hot oven for 15 to 20 minutes. Those babies are perfect at parties and an ideal healthy snack for lunch-boxes! Give it a try and let me know how you liked them! Thanks to cocinasera for the great recipe! Click the name to visit their website, you’ll find a lot of inspiration! Check out also my low carb zucchini ricotta bread! !